Sales for the month rose 31% to 19,384 compared with 14,793 a year earlier. For the first quarter, sales jumped 36.8% to 50,529, compared with 36,937 in the 2017 period. First-quarter sales are typically the weakest of the year. “The general comment I would make, to use a sports metaphor, is this one is right smack in the middle of the fairway,” ACT Research Co. Vice President Steve Tam said. Looking ahead in 2018, ACT expects a 35% increase in sales on the tractor side and a 14% lift in vocational sales compared with last year. ACT’s overall forecast for U.S. heavy-duty retail sales this year is 254,000, up 29% from last year. Freightliner continued as the market leader in March with sales rising 41.1% to 7,508 trucks, good for a 38.7% monthly market share. 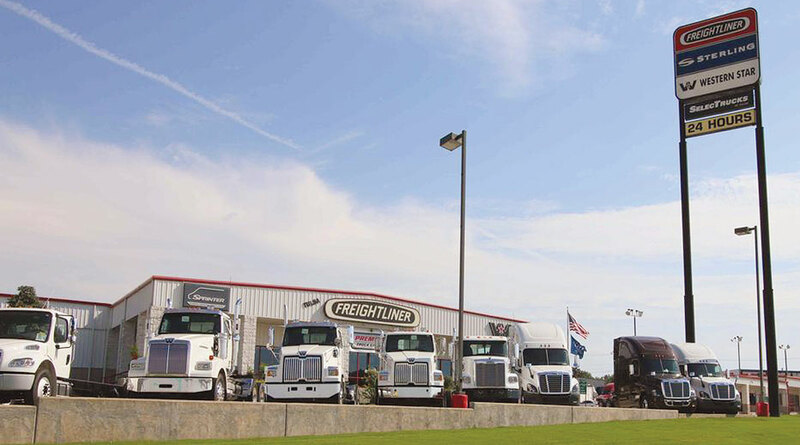 A recent survey of 25 Freightliner dealers by a financial analyst showed dealers expect their sales to increase about 20% on average in 2018. Another analyst also expected sales to improve. “The numbers were good, and we expect them to get much higher in the coming months,” said Don Ake, vice president of commercial vehicles at research firm FTR. “When capacity utilization gets this high [estimated 98%], then any fleet that wants to expand, there is freight out there to haul. And you get fleets of all sizes trying to expand in some form or another,” he added. American Trucking Associations Chief Economist Bob Costello said the driver shortage is forestalling growth for truckload carriers, including smaller ones that previously had lifted the sales market. In the temperature-controlled sector, one carrier has found room for growth, expanding its fleet by 100 trucks this year after adding 100 in 2017. Its largest consumer care shipper is Johnson & Johnson, and Tribe won that shipper’s 2017 carrier of the year award in the temperature-controlled truckload segment. Once all its new trucks are added in, Tribe will have 445 company trucks plus an owner-operator fleet of 125 trucks. Its latest new trucks are Kenworth T680s. The truck's come with Paccar Inc.'s integrated powertrain, which combines a 12-speed automated transmission, the MX-13 engine and the proprietary 40,000-pound tandem rear axle. "We were a part of the initial Kenworth test on the new powertrain, and the positive results along with single-sourcing the vendor were our reasons for the purchase" of that model, Handte said. Kenworth Truck Co., a unit of Paccar, saw sales jump 37.7% to 2,908 and a 15% share in March. Peterbilt Motors Co., also a Paccar brand, notched a 28.8% gain, selling 2,824 for a 14.6% share. However, International Truck had the biggest bounce in March, up 50.9% on sales of 2,143 for an 11.1% share. “There are a lot of things going in our favor right now, with the introduction of the LT series [of linehaul trucks in the fall of 2016],” said Jeff Sass, senior vice president of North America Truck Sales for Navistar. Also, Sass said International is holding its own in the vocational market. International recently introduced two new models for this segment, the HX and HV series. “We are a new brand, almost, to some of these customers,” he said. Meanwhile, Mack Trucks has increased its build rate 40% year-over-year, a company executive said in March. But in that month, Mack saw sales slide 17.5% to 1,368, good for a 7.1% share. Volvo Trucks North America’s sales jumped 33.2% to 2,185 and an 11.3% share. Mack and VTNA are brands of Volvo Group. At the same time, Western Star, DTNA’s niche brand, posted a 0.2% gain on sales of 448 trucks, earning a 2.3% share.